More mountain homes are featuring exciting and innovative uses of glass, and glass producers are making products that save energy and aesthetically enhance the home in unexpected new ways. So often, as with glass, advances in building materials work hand-in-hand with design as new building materials inspire designs that push the envelope, and bold new designs demand more from the material suppliers and installers. Mountain climate extremes previously limited the use of glass, but now products address strident energy requirements, and artful new uses of glass are appearing that were imagined 100 years ago but not available until recently. There is something decidedly modern about big glass, although glass windows have been around since well before the Roman Empire. It wasn’t until the 17th century that glass became common in homes, and then and into much of the 19th century, glass was hand-blown and expensive. Hand-formed pieces were mounted together in panes for larger windows. The initial glass recipe was pure silica (sand) melted in furnaces at high temperatures along with additions that changed the melting characteristics and qualities of the glass like sodium carbonate, lime, iron, and various metal oxides. The inspiration took root, and glass and metal soon became synonymous with modern architecture. However, products to implement the vision of glass in homes didn’t stand up to the dream. One of the most endearing mid-century modern American homes is glass-walled, the Farnsworth House (1945–51) designed by Ludwig Mies van der Rohe in Plano, Illinois. However, even the iconic Farnsworth home receives criticism for discomfort with winter heat loss and too much summer heat gain. Stephen Dynia’s story highlights the progress in energy-smart glass. With ordinary windows, up to 87% of heat gain and 49% of heat loss occurs. The glass and window industry responded to the energy crisis in the 1970s, the sustainable green building movement, and Europe’s strict energy standards for greenhouse gas emissions by developing better performing and even bigger windows. Current home designs require an energy analysis. Where energy is lost through windows, other components of the design like more insulation or higher efficiency heating and cooling systems must compensate. This can limit the use of windows or raise costs. There are many new advances useful to architects today. Iron in glass introduces a green color, and Stephen Dynia likes the clarity of low-iron glass. “It’s very clear, especially at the edge.” He comments that window efficiency is not just the advances in the production of glass, but also in the window frame systems. “There are some very high-efficiency, high-end custom windows being built in the United States and Europe. They really do a good job with double or triple pane frames,” adds Dynia. New products are changing the interior of homes as well. 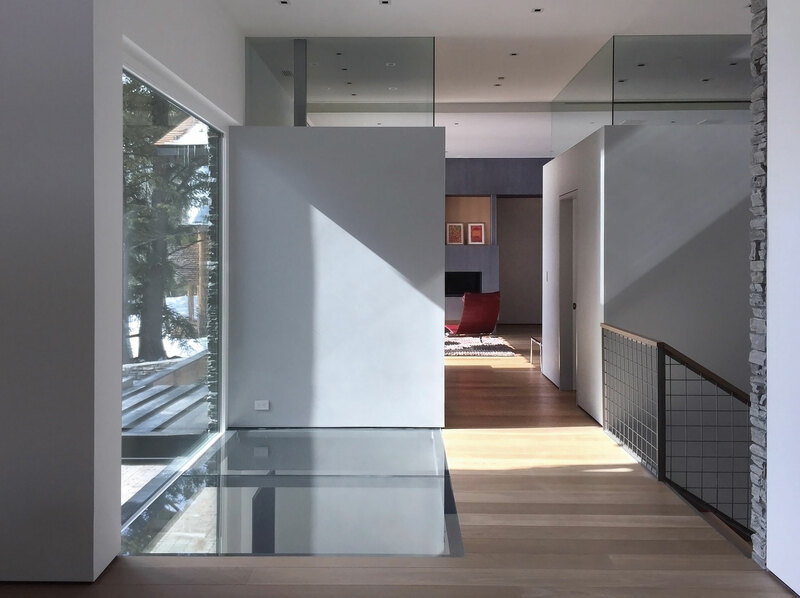 “There are so many interesting things you can do playfully with glass,” Stephen Dynia exclaims and then describes some of his innovations, beginning with a frameless glass pivot door for the entry of a home. Other applications he has used are decorated, back-painted glass tiles, laminated rice paper for a diaphanous effect, textural interior partitions, and progressive fritting, or patterns that shift to become increasingly transparent. “It’s magical, like smoke,” Dynia describes. Again, technology makes glass safer inside homes. Annealed glass is what we commonly think as glass that shatters into jagged shards from a misdirected baseball. To make it safer, glass is tempered, laminated, and reinforced. Extreme heat and rapid cooling in the manufacturing process creates tempered glass. 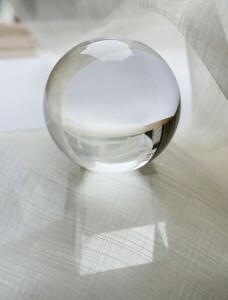 It is harder and more heat-resistant than normal glass, plus it breaks into small ovals instead of sharp shards. Laminated glass contains a durable plastic inner layer that holds it together when shattered, and reinforced glass has an addition of an impact-resistant material or layer like wire mesh or a coating. Laminated tempered glass is the preferred product for glass floors like those Stephen Dynia installs, furniture, and stairs. 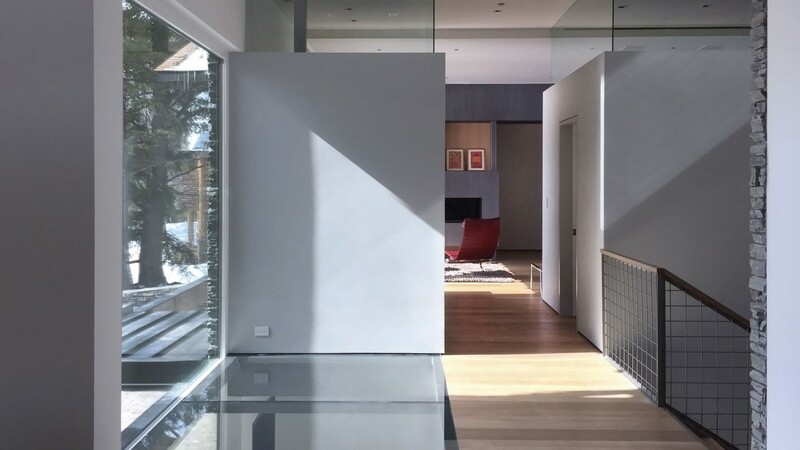 Italian triple-glazed laminated Low-E thin windows allow one to essentially see through this home’s walls. PHOTOS Courtesy of Atelier One, Ltd.